U.N. spokesman Stephane Dujarric responded to questions on Wednesday about Secretary-General Antonio Guterres’ response to the U.S. withdrawal from the Geneva-based council. He says Guterres made these points when U.S. Ambassador Nikki Haley called him Tuesday to give him “a heads up” about the U.S. action. U.S. Ambassador to the United Nations Nikki Haley is accusing human rights groups of undermining the United States and putting themselves “on the side of Russia and China” by seeking to prevent the U.S. from leaving the U.N. Human Rights Council. Haley criticized the non-governmental organizations in a letter the day after she announced the U.S. was exiting the council. A copy of the letter was obtained by The Associated Press Wednesday. Haley says the organizations wrote a joint letter to members of the Human Rights Council urging them to oppose a U.S.-sponsored resolution to reform it. She says they tried to “block negotiations” and “thwart reform.” Haley says that was “a contributing factor” in the U.S. decision to leave the council. John Bolton told Fox News on Wednesday the decision was made by President Donald Trump weeks ago and had nothing to do with high commissioner’s criticism of the U.S. immigration policies. U.S. allies, including Australia and the European Union, have joined voices expressing disappointment and regret that the United States is quitting the U.N.’s main human rights body. Diplomats from several countries made the comments in a brief break in the Human Rights Council’s regular schedule on Wednesday to allow for comments about the Trump administration’s decision Tuesday to pull out from the 47-member council. The U.S. is the first country to exit voluntarily in the council’s 12-year history. President Borut Pahor of Slovenia — the home country of U.S. first lady Melania Trump — said the American withdrawal was “bad news” for the council, the United Nations, the U.S. and “everybody” who cares about human rights. The United States is emphasizing that its pullout from the United Nations’ main human rights body doesn’t mean it’s stopping its work with the U.N.’s rights chief. 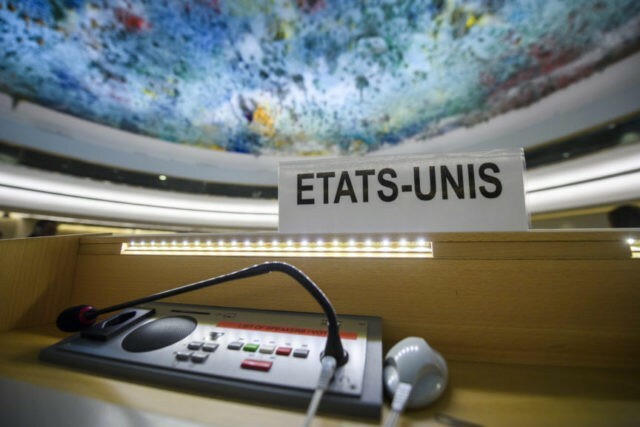 “We have a very strong relationship with the OHCHR and will continue to promote human rights and fundamental freedoms through that relationship,” the press office of the U.S. mission in Geneva said in an email. The human rights office, or OHCHR, is a permanent U.N. organization that ultimately falls under Secretary-General Antonio Guterres. The United States is traditionally one of its largest donors. The Human Rights Council is a 47-country body that draws its mandate from the U.N. General Assembly, and meets three times a year in Geneva. The U.S. announced its withdrawal from the council on Wednesday, citing among other things its alleged anti-Israel bias. Russia says that the U.S. exit from the United Nations’ Human Rights Council reflects Washington’s unilateralist approach to global affairs. The U.S. Ambassador to the U.N., Nikki Haley, announced the pullout Tuesday, criticizing the council for “its chronic bias against Israel” and pointing out that it includes accused human rights abusers such as China, Cuba, Venezuela and Congo.